These modules not only drive four analog output channels and also feature four discrete outputs for on/off control but also provides Isolation that separates the output, power, and network circuits. 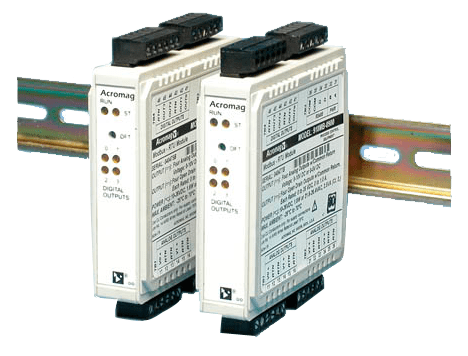 Network communication supports the industry-standard RS-485 Modbus RTU protocol. – Better than ±0.001% of output span per °C, or ±1.0uV/°C, whichever is greater. – Operation (917MB): -25°C to 60°C* (-13°F to 140°F*). – Operation (918MB): -25°C to 70°C (-13°F to 158°F). – * Limit 917MB maximum ambient to 50°C (122°F) when using supply voltages less than 15V DC. – ±0.1% of span or ±2 LSB typical, whichever is larger, for spans equal to or greater than 16mA. – 12V minimum, 12.7V typical. – 0 to 630 ohms typical. – 11ms typical into 500 ohms, for measurement to reach 98% of the final value in response to a step command. Actual response time will vary with load. – Range user-configured. Selection applies to all channels. – ±0.1% of span or ±2 LSB typical, whichever is larger, for spans equal to or greater than 5V. – 0 to 10mA DC maximum. – 110µs rise time typical, 150µs fall time typical, unloaded, for output to reach 98% of the final value in response to a step command. Time varies with load. – 0 to 35V DC (up to 1A/channel continuous). – Transition of the output MOSFET. The command/response protocol for communicatingwith this module adheres to the Modbus/RTU standard for the following Modbus Functions. – 10 to 36V DC (918MB), 12 to 36V DC (917MB) 22 to 26V AC. – 3-way isolation between outputs, network, and power circuits.